On stage at the Hollywood Roosevelt Hotel are filmmakers Rima Das (l) and Sophie Dupuis, panelists at the AFI Fest's "The Language of Cinema: International Directors" session (photo by Randall Michelson/courtesy of AFI). Pictured (l-r) are participants in the AFI Fest’s “The Language of Cinema: International Directors” panel discussion held on Saturday, Nov. 10, at the Hollywood Roosevelt Hotel in Hollywood, Calif.: filmmakers László Nemes, Sophie Dupuis, Florian Henckel von Donnersmarck and Rima Das, along with session moderator, producer Barry Sabath of the AFI Conservatory (photo by Randall Michelson/courtesy of AFI). 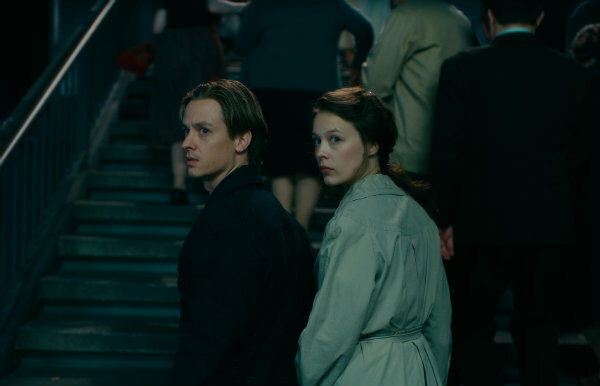 A scene from "Never Look Away," Germany's entry for this year's Best Foreign Language Film Oscar--directed by Florian Henckel von Donnersmarck (photo courtesy of AFI Fest). The directors behind four of this year’s entrants in the running for the Best Foreign Language Film Oscar shared insights into their creative inspirations and key collaborators during a session at the week-long AFI Fest which wraps today (11/15) in Hollywood. Titled “The Language of Cinema: International Directors,” the panel discussion featured filmmakers Rima Das whose Village Rockstars (Flying River Films) is India’s official Oscar entry; Sophie Dupuis, who directed Canada’s entry, Family First (Axia Films); Florian Henckel von Donnersmarck whose Never Look Away (Sony Pictures Classics) is Germany’s entry; and László Nemes who helmed Hungary’s entry, Sunset (Playtime). The session was moderated by producer Barry Sabath who teaches World Cinema at the AFI Conservatory. In that creative spirit, Henckel von Donnersmarck eventually found his subject, a German painter on whom he based his fictionalized character, an artist who’s escaped East Germany and now lives in West Germany but is tormented by his childhood under the Nazis and the German Democratic Republic regime. Henckel von Donnersmarck credited a key collaborator with helping to bring his vision for Never Look Away to fruition: cinematographer Caleb Deschanel. Henckel von Donnersmarck remembered as a youngster going to see The Black Stallion, which he described as a rare big art film for children. That was Deschanel’s debut as a cinematographer and the “breathtakingly beautiful images” left an indelible impression on Henckel von Donnersmarck who went onto be a fan of the cinematographer’s work which includes The Right Stuff, Being There, The Natural, Passion of The Christ and The Patriot. Henckel von Donnersmarck said he approached Deschanel without even a script for Never Look Away--just the idea. The director recalled Deschanel saying, “Write it the way you told me and I’m in.” Henckel von Donnersmarck described Deschanel as “the hardest working and most diligent person” he had ever witnessed, shooting Never Look Away in four countries over a six-month span. Deschanel was integral to the project in that it’s a film about a painter creating images. “The images on screen have to hold up and stand up” to the paintings, explained the director. Deschanel was more than up to the challenge. The only disappointment for Henckel von Donnersmarck was that he hoped to gain an understanding of how Deschanel lights--but it is so intuitive that the director couldn’t gain the handle he had hoped for relative to the DP’s lighting approach. Henckel von Donnersmarck could also glean that Deschanel goes about lighting “in an emotional way,” based in part on how he “understands acting on a deep level” and thus he creates a light in which actors can move freely. A five-time Best Cinematography Oscar nominee (The Right Stuff, The Natural, Fly Away Home, The Patriot, The Passion of the Christ), Deschanel is currently working on the live-action version of The Lion King, which Henckel von Donnersmarck said he can’t wait to see. Nemes too is a past Academy Award winner, earning Best Foreign Film Oscar distinction in 2016 for Son of Saul. In Sunset, he reunites with Son of Saul actress Juli Jakab who portrays Irisz Leiter, a young girl who grows up to become strong and fearless in Budapest before World War I, embarking on a quest for a brother whom she learns of for the first time. During her journey she stumbles across secrets and witnesses developments that lead to the eventual collapse of the Austro-Hungarian Empire. Nemes said he’s inspired by the lessons of cinema and its ability to pull people out of their comfort zone. Through its main character, Sunset shows Europe--at the height of its powers and cultural sophistication--entering a labyrinth maze leading it to descend into a self-destructive mode. A self-taught filmmaker, Das gained acclaim for Village Rockstars, which introduces us to a 10-year-old girl in an impoverished northeast India village who dreams of getting a guitar and forming a rock band with local boys. There are parallels between the story and Das herself in that she too was brought up in a poor village in India whose dream was to be an actor, leading her on a self-described “fairytale journey” to a career in cinema. “Through cinema, you can create your own world,” she said, explaining the allure of filmmaking. When she realized that she wanted to be a filmmaker, Das was too old to go to film school. So she educated herself to “tell stories” and live her vision. That vision has been realized not only in Village Rockstars but in her Bulbul Can Sing, which was screened at AFI Fest as part of the World Cinema lineup. Writer-director Das also serves as her own cinematographer, collaborating with a small crew. For Village Rockstars, she deployed a Canon EOS 5D Mark II camera, lensing a cast of non-professional child actors. Dupuis is in this year’s foreign film Oscar hunt on the strength of her feature debut, Family First, a crime drama which introduces us to JP who lives with his brother Vincent, his mother Joe and his girlfriend Mel in a small apartment. JP maintains a delicate balancing act, responsible for the needs of his family, holding a job with his brother, and involved in a drug cartel run by his uncle whom he regards as a father figure. “It’s a family movie,” said Dupuis who noted that she’s “fascinated about a fraternal relationship because I am an only child” who hasn’t experienced that kind of bond. The film took two years for Dupuis to write, with countless drafts penned in the process. Dupuis praised Mathieu Laverdière, her cinematographer on Family First. “He has emotional intelligence,” she said of the DP, noting that character JP has an “explosive energy” that easily could have been “too much” for the story, meaning that a thin line had to be traversed. To help attain the proper balance, Dupuis chose to have five weeks of rehearsals prior to shooting. In the script, JP was violent and unfriendly while through the rehearsal process Laverdiere in his cinematography was ultimately able to capture his “love and friendliness” to give the character an added dimension. This is the second of a multi-part series with future installments of The Road To Oscar slated to run in the weekly SHOOT>e.dition, The SHOOT Dailies and on SHOOTonline.com, with select installments also in print issues. The series will appear weekly through the Academy Awards gala ceremony. Nominations for the 91st Academy Awards will be announced on Tuesday, January 22, 2019. The 91st Oscars will be held on Sunday, February 24, 2019, at the Dolby Theatre at Hollywood & Highland Center in Hollywood, and will be televised live on the ABC Television Network. The Oscars also will be televised live in more than 225 countries and territories worldwide.